I just finished reading – In the Name of Gucci: A Memoir, by Patricia Gucci, (Crown Archetype, 2016). Gucci is still around but do you remember the brand in its heyday? You might be conjuring up images of the iconic red and green stripe or the double G logo. Gucci began in 1921 but by the 1950s it had become THE luxury fashion brand on everyone’s must-have list. The family-run business continued to soar in popularity around the world until 1989 when it was sold to Investcorp. In her memoir, Patricia, the love child of Aldo Gucci and his mistress Bruna, shares for the first time the compelling and complicated story of her parents, the Gucci family, and the history of the status brand, which was the first Italian company to open retail shops in the U.S. prompting the Made In Italy phenomenon. When Patricia was born in 1963, her father was middle-aged, the head of (and powerhouse behind) Gucci as well as a married man with three sons. Her mother was 32 years his junior and a former employee of the Gucci shop in Rome. The couple kept their relationship and their daughter a secret … for as long as they could. Did I mention it’s complicated? Well, it is and I tip my hat to Patricia and co-writer Wendy Holden for their excellent crafting. The authors successfully keep clear for the reader all the various elements to the story, which begins in 1897 with Patricia’s grandfather. At 16 Guccio immigrated from his small Italian village to London to work as a page for the Savoy Hotel. After returning to Italy several years later Guccio opened a luggage shop in Florence, which was to eventually become the Gucci we think of today. A man of impeccable taste, my grandfather hoped to create the kind of superior leather goods he’d been handling since he was a boy, only using cheaper hides enhanced by skilled dyeing and treating techniques. His own elegant designs based loosely on English tailoring and style were pieced together by Florentine craftsmen with their eye for detail. Each new item carried the first Gucci monogram – a tiny image of a young page in full livery and a cap carrying a suitcase in one hand and Gladstone bag in the other. It was my grandfather’s nod to his formative days. There is so much to this memoir – a love affair, the rise and fall of a fashion brand, secrets and family betrayal. It’s an operatic story for sure but Patricia doesn’t take advantage of that; she simply tells it like it was. Although her affection for her father, who died in 1990, comes through she remains honest and does a nice job balancing her emotions. Relationships can be tricky to navigate. Those we have with our parents can be the most complicated and often require compromises once we come to the realization that none of us live in a perfect world and that the people we love are flawed. I enjoyed most reading about the history of the company and Patricia’s later involvement as a spokesperson, model, and board member. Indeed she was the first female board member in the company’s 90 year history. I am curious about who was designing for the brand during Aldo’s reign. Who for example came up with the Jackie O handbag? It’s been thirty years since the sale of Gucci and 26 since Aldo died. Why a memoir now? Patricia was under a gag order for ten years after the sale but beyond that, she never really knew the whole story between her parents. Any time she asked her mother for details, she was shut down. Until 2009, when Bruna unexpectedly opened up and handed over a stack of Aldo’s love letters written while the couple were secretly courting. That was the beginning of In the Name of Gucci. I became so captivated by this book that time flew by unnoticed. I didn’t want to put it down and I didn’t want it to end. It can’t get any better than that. … fashion is the armor to survive the reality of every day life. I don’t think you could do away with it. It would be like doing away with civilization. – Bill Cunningham (1929-2016), fashion photographer for the New York Times. Quoted in the documentary, Bill Cunningham New York. I was sad to hear that Mr. Cunningham had passed away this last Saturday after suffering a stroke. From his modesty to his signature French blue working jacket to his keen eye for unique fashion – there will never be another Bill Cunningham. RIP. A year ago this month on a sunny afternoon in an attractive Oakland neighborhood, I was walking back to my car after a medical appointment at Kaiser. I turned the corner with thoughts of dinner that night, when a man I was passing on a narrow sidewalk swiftly grabbed my arm, showed me a gun and demanded my handbag. He didn’t physically harm me but he did get my bag, hopped back into the waiting car (stolen as it turns out) and sped off with my phone, wallet, car keys … In just a flash I had no way to get home, no way to contact anyone. My car sat just a few blocks away but I couldn’t unlock it. It’s something, let me tell you, standing in the middle of a big city feeling completely stripped. It is that sudden and unexpected sense of helplessness I felt at the time and so many emotions since then that have inspired me to mark the one year anniversary with a post about what I have learned from getting mugged. For weeks afterwards, out of nowhere I’d flash on something and think, “I must have lost that in the mugging.” Not just drivers license, credit cards, and keys but a surprising number of items that were of value only to me. One of the nothings that was everything was a slip of paper with a poem my stepfather had written 30 years ago about our family cat. I had recently discovered it tucked inside a book and I was intending to show it to my mother. I obsessed on the stupidity of that little piece of paper to have lasted all these years and now it was gone, sitting in a gutter somewhere along with other personal possessions like my notebook, a leather cosmetic bag from Italy, and a lovely handwoven scarf that was a gift. I felt exposed and irrationally responsible for these lost things. We all do it, I think. Stuff things into our handbag not really giving it a second thought but soon the handbag becomes a receptacle for too much, most of which is just taking up space. Now I carry only what I need for the day. Things like postage stamps, gift cards, library card and Clipper Card stay home unless I need them that day. In in my wallet is one credit card, AAA card, and drivers license – that’s it! Anything personal and sentimental like letters, photos, notebook are also left at home. On that day I was sporting a shoulder bag – an easy grab for a thief. Currently when I’m out and about I use a cross-body bag, which isn’t as easy a mark. Bad guys look for quick opportunities to steal and a cross-body bag takes too long. The guy who mugged me was sitting in his stolen car waiting for someone to come along at just the right moment when no one else was around on an otherwise busy street. He must have cased the area and knew he only had seconds. The fact that I was carrying a shoulder bag made it faster and easier to grab and go. For quite some time after the mugging I was not myself but rather, a paranoid wreck who seriously believed that every time I ventured out I would get targeted again. The only place I felt safe was at my job and at home. But I made myself get back out into the world. Something that helped me do it was a little pouch around my neck in which I kept my cell phone, keys, and cash. It gave me confidence, thinking that if I got mugged again the thief might get the big bag but I’d have the important things hidden away. I still use a pouch when I’m headed to certain places and I’m currently designing a slim stylish bag that can be worn underneath clothing. Getting mugged was a shocking experience and it took some time to get past it but I am grateful that I wasn’t hurt. I tip my hat to the Oakland Police Department who responded right away and kept up the investigation, trying to catch this guy. I also had quite a lot of personal support for which I’m also grateful. I hope OverDressed for Life readers will consider my tips. I know most of us think (I did) this cannot happen to me. But it’s a crazy world and it can happen to anyone, sadly, in pretty much any neighborhood at any time. Please feel free to pass this post along and hey, stay safe out there. In recent years, the global retail landscape has become boring. There is very little to discover or explore in another country that you’ve not already seen online or in a store near you. – Anne Pitcher, managing director of Selfridges department store, London. I agree with Ms. Pitcher. I’ve noticed in my travels to the UK there is nothing unique to be found. It’s all the same stuff made in China and sold everywhere else including online. That is if you shop at department stores. There is an alternative. Unique treasures abound at antique markets. I like the Covent Garden Antique Market held every Monday, where I find jewelry, silver, vintage clothing and accessories. Antiques not your thing? On the weekends the market offers locally made arts and crafts. So it can be done … anywhere you travel, look for antique markets and locally owned shops that feature handmade merchandise. 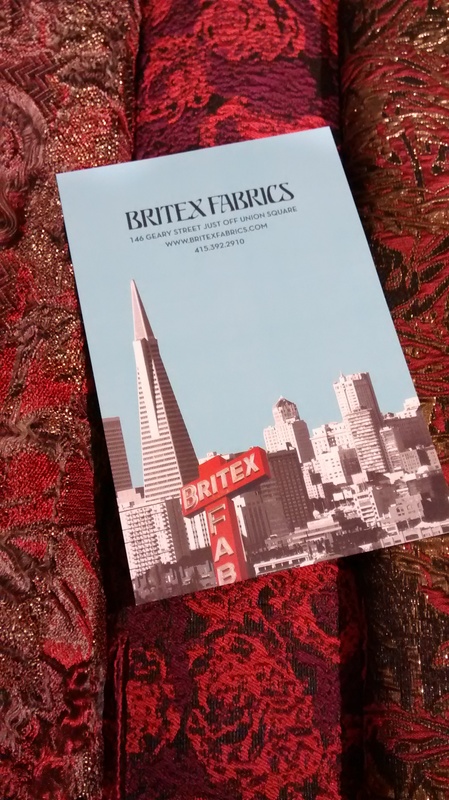 It’s free, it’s easy, it’s very informative, it’s a tour of Britex Fabrics! I recently took this tour and it was even better than I expected. Lizzie works on first floor of Britex and is your go-to gal for all things fancy and bridal. Britex employee Lizzie, donning one of her own creations and with infectious enthusiasm, guided us through all four floors of exquisite wools, silks, velvet … you name it. As she pulled out particularly beautiful and unique bolts of fabric from the French Lace collection (usually sectioned off by a red velvet rope), Lizzie shared with us the history of the store which opened in San Francisco in 1952. Martin and Lucy Spector owned a fabric store in NYC but while visiting here on vacation the couple fell in love with our city and relocated themselves and their shop. Since then, Britex has become a local treasure attracting brides, designers, society ladies, and lovers of textiles. Today Britex is run by the Spectors’ daughter Sharman, who travels the world looking for the best quality in fabrics for her customers: wool from Italy, lace from France, linen from Japan. Among the curated selection are fabrics used by designers such as Chanel and Gucci, unused bolts that may be a season or two old but just as beautiful. Lace from France is made with ancient machines? Velvet has to be stored hung on tiny pin-like hooks so as not to crease and flatten the nap? Every bolt of fabric on the shelves of Britex has been tested for its content? I learned all that and more. Britex Fabrics store tour happens every other Saturday, 11am (Next one is June 25th.) One full hour, questions are encouraged as is feeling the fabric, which, I warn you, can be addictive. Britex Fabrics, 146 Geary St. SF. Quite frankly, the way I see fashion after being in the business since 1967, fashion is out of fashion. And if fashion is what you look like, you do not represent the modern woman. Style can be fashionable, but this whole idea that the fashion industry is the same and fashion has the same meaning in a woman’s life, it doesn’t. It’s completely different. Today it’s instantaneous: “I want this now, I want it overnight,” if not the same day. I don’t want to wait for anything. I mean, I’m one of those shoppers myself, I only shop online. I never go into stores. – Norma Kamali, American fashion designer, as quoted in an interview for Women’s Wear Daily. Norma Kamali fleece designs in the 1980s. In the 1980s, way before the idea of ath-leisure, Ms. Kamali designed a line of women’s clothing using gray fleece. She used the sporty material for structured silhouettes – dresses, skirts, and oversized tops with shoulder pads. It was unexpected, it was chic and a big hit both with the fashion press and customers. As for her point that fashion is not fashionable. (I think that is what she’s saying.) Well, there is much discussion going on about what fashion is these days. Currently there is a slight push-back against corporate fashion and name brands with people concerned about the environment, sweatshops, and blind consumerism. With a trend toward recycle/reuse, a desire for individual style has developed. Still, I’m seeing a lot of leggings and tunics out there, not to mention ath-leisure. I believe that despite the changes in the way we find our fashion and how we buy it, fashion is what it has always been – trends that can come from designers, celebrities, or people on the street. Congratulations to Ms. Kamali for her recent CFDA Lifetime Achievement Award. Apparently it was also considered a loser for Donna Karan, who says her design was panned by Women’s Wear Daily back in the day. Fast forward 23 years and the cold- shoulder dress is all over the runways this season. Two women ahead of their time. It’s the California primaries today – best of luck to Hillary Clinton.